Subject description: Need a bit of help figuring this one out! My 4017 based sequencer build is almost finished, but I wanted to have a momentaty push button to trigger an effect. My idea is to trigger an action for 4 or 8 steps of the sequencer then revert back to normal. The idea was to use a 4015 and tie either 4 or 8 outputs together to send a high signal to a 4066 switch. The switch stays open for the number of steps tied together, then closes again afterwards. The 4015 uses the same clock as the 4017, and the data input to the shift register keeps the effect going. Are there any other ways to achieve a signal to the 4066 for a set number of steps that i can activate with one momentary switch closure? then reset the flip/flop when the counter reaches the number of steps you want. reaches the number of steps you want. Got it working used an RC circuit to trigger a momentary clock pulse into a JK flip flop, which latched until a 4017 counted 4 beats then reset. Just tied the flip flop latch to a 4066 to keep the switch closed for the 4 beats. I swear it's on the way! Was going to wait til I'd finished the whole project and then upload one, but the whole thing has just grown organically as I've learned new things. There are 24 breadboards and over 60 ic's. There are 24 breadboards and over 60 ic's. I think that's beyond anything I've built, what the hell are you building ?! 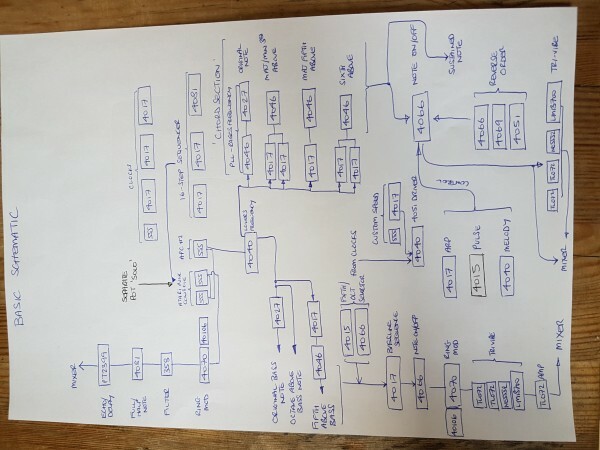 16 step sequencer for the "lead"
The same 555's produce everything so it stays "in tune"
I had to print out that block diagram to fully appreciate what you are building. I notice a lot of 4046 / 4017 combinations. To save on board space it might be worthwhile to look at this circuit: http://electro-music.com/forum/topic-28799.html for your VCOs. You can feed the control voltage from an XOR / resistor / capacitor type comparator but you will need 50% duty cycles to compare. Get them by using the 4018 instead of the 4017. Because of the extra glue logic you might find this doesn't save much but it could be worth checking. Those 4046/4017 combos are just frequency multipliers to get 3rds and 5ths etc. So the circuit is a poor man's VCO. Ignore Q2 and its downstream circuitry and take the 4018 clock directly from "b". Ignore Q3 and its associated circuitry unless you want to use that as your VCO output. Ignore R1 and R10 because you are not using manual control. Connect the 4018 output and a reference clock as inputs to an XOR. Output from the XOR goes to a resistor / capacitor low pass filter and the output from that goes to CV In on the diagram. There is your phase locked loop with 1/6 of a 40106, 1/4 of a 4070 and a 4018. You could tune all your VCOs to the same base frequency like the drones on a bagpipe. Thank you for the help and suggestions guys I appreciate it. Phobos - I tried your elegant transistor idea to switch out the 4046 during the "dead time" but failed miserably. So, I've gone for a brute force method instead! Each step from the 4017 has an SPDT to turn it on/off. In the off position I can send the signal instead to a 4069 (via a diode) which sends a zero to an analog switch. The switch normally allows the signal to the mixer. 4046. Making this pin high wil shut it up so you can attach the switches (with some diodes) directly to it. I found a simplified Steiner Parker filter variant which gives HP/LP/BP and sounds pretty good. For the dual gang pots i originally used 200k. 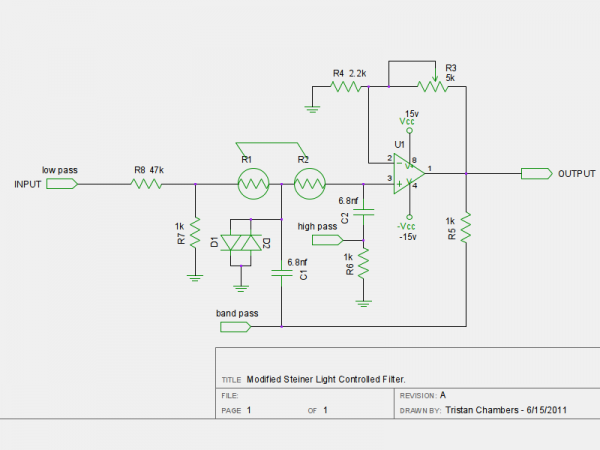 The schematic below is from the site I found it on but I changed some of the resistor values when building it. But you get the general idea. Thanks for this, I'll give it save. Looks similar to some other designs I've seen but that diode section in the lower part seems unique, I'll have to build it up. How do you get the v- for the opamp? Is your project on a dual supply or did you create a voltage reference ladder with some resistors? From what I can gather the diodes help prevent the op amp running into wild oscillation, but someone who knows what they're on about might be able to explain better! I used GND for -V as my build is single supply 0 - +9V. Still sounds nice. One thing worth trying is different dual pot values. My first try was with 500k pot. The LP and HP filters really squealed at the top end which gave it loads of character. In the end I swapped for a 200k so that the sweep made better use of the range available (i.e with 500k there was alot of wasted range where nothing happened) since doing that i can only get the mad squealing on the LP. Might have something to do with the resistance matching in the dual gang pot.